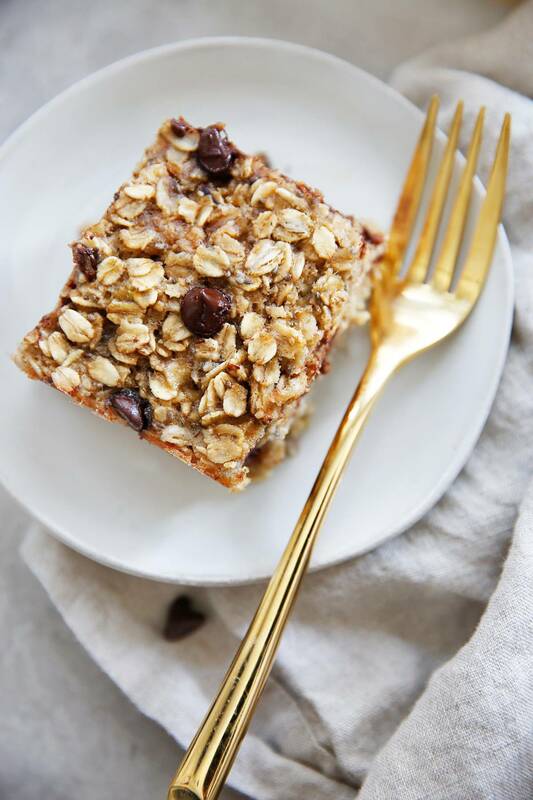 This dairy-free and gluten-free Peanut Butter, Banana, and Chocolate Chip Baked Oatmeal is the ultimate make-ahead fiber-rich breakfast for a busy week, perfect for a breakfast potluck, or snack, and is absolutely the best flavor combo! Made in partnership with Enjoy Life Foods! 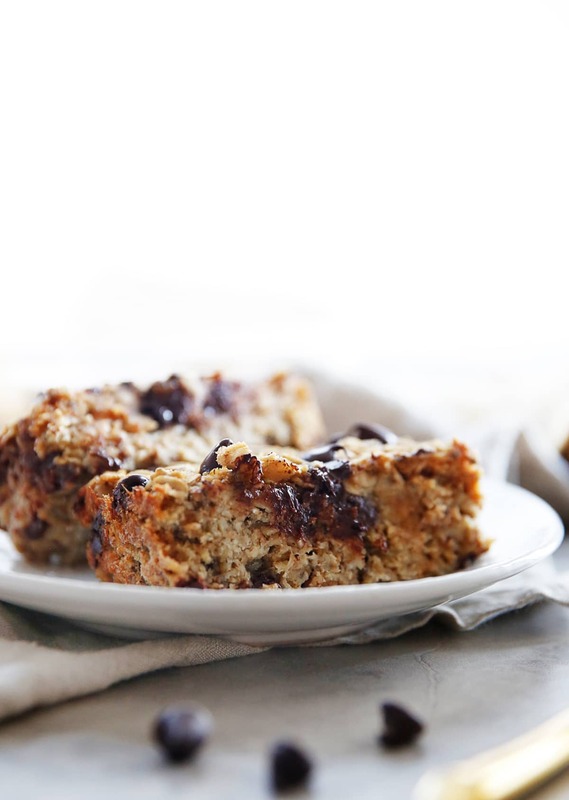 I am so excited about this healthy baked oatmeal recipe! 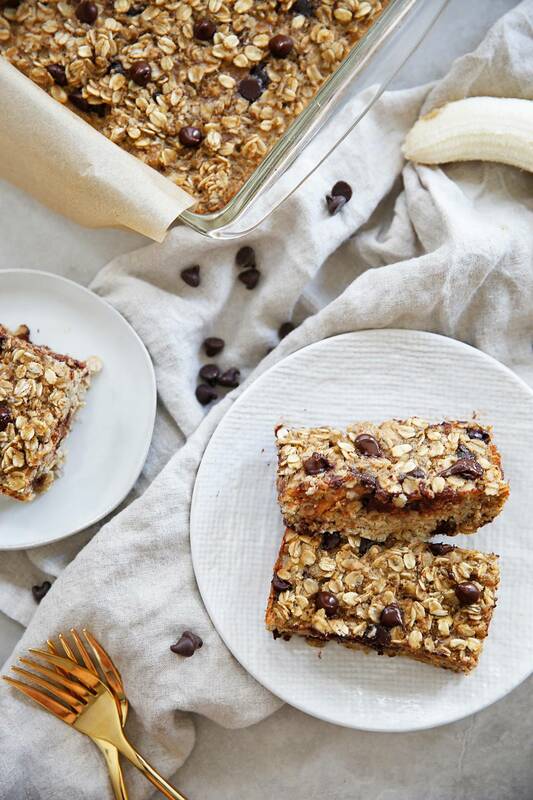 Who doesn’t love the combination of peanut butter, banana, and chocolate chips baked into an ooey-gooey fiber rich breakfast bake? It’s a super simple one-bowl recipe and can easily be made ahead of time, though we do think it is SO TASTY straight from the oven too. This oatmeal bake is based off of our popular Oatmeal Cups recipe so it has the perfect almond milk (or milk of choice) to oats ratio. I’ve been using Enjoy Life Foods chocolate for YEARS! All their products are specially made to be free from gluten and the 14 most common food allergens – wheat, peanuts, tree nuts, dairy, casein, soy, egg, sesame, sulfites, lupin, mustard, fish, shellfish & crustaceans. They even make all of products in a special allergy friendly facility, which is pretty great. Plus, the chocolate is delicious! I love the dark chocolate chips and the mini chocolate chips for all of our baking, especially this oatmeal! I find Enjoy Life Chocolate in all of my major grocery stores which is a huge time saving bonus, and you can use their easy Store Locator to find stores near you! PLUS, here’s a special coupon for $2 off their baking chocolate – you can print and use in-store! When it comes to freezing baked oatmeal, you simply make up the baked oatmeal recipe, let it cool, and freeze it! Can you bake instant oatmeal? The short answer is not really! Instant oatmeal is different than regular oatmeal because it is thinly cut, processed and flavored. They don’t lend the same structure to baked goods as regular oats or quick oats! P.S. You can sub out for your favorite nut butter here, or to make it nut-free use sun butter. Pre-heat oven to 350 degrees and grease an 8" x 8" oven-safe dish. If desired, prepare a parchment sling by cutting out a piece of parchment paper slightly larger than the pan (for easy removal of bake). In a large bowl mash bananas until they are smooth. Add eggs and whisk to combine. Then add peanut butter, maple syrup, almond milk, oil, apple sauce and vanilla until fully combined. To the wet ingredients add oats, baking powder, chia, salt and chocolate chips and mix until fully combined. Scoop or cut and serve warm as is or with almond milk, or cool and slice into 9 square portions. You can sub out for your favorite nut butter here, or to make it nut-free use sun butter. ENTER the BIG chocolate giveaway!!!! One of my amazing readers will win a year’s supply of Enjoy Life Foods baking chocolate! Bonus Entry: Tag 2 friends in THIS Instagram post! This post is sponsored by Enjoy Life Foods. All thoughts and opinions are always 100% my own! I love the integrity of their products and think you’ll love them too. Thank you for continuing to support LCK and the brands I work with! Thank you Lexi. Yet another great recipe. Yum!! Definitely need to make this for a quick breakfast or snack. This looks delicious!! I can’t wait to make it!! I am definitely making this one! Been using Enjoy Life chips for a few years now! Love them! This looks so good and a worthy breakfast for after my workouts that’s healthy and treat like! Thanks for the recipe, going onto Sunday meal prep list for this week! Sounds delicious!!! Can’t wait to make this when I get back home from vacation. It looks soo delicious, I can’t wait to make it! After buying these chocolate chips once I havent gotten anything else. Thank you for all the recipes you have on your blog!! Cant wait to try this!!! Yum! Yum! Will have to work this into the rotation! Have been upping my oatmeal as a new mom to help with newborn feedings. This will make early mornings a lot easier! So excited to try this one out! Yesssssa!! These look amazing. 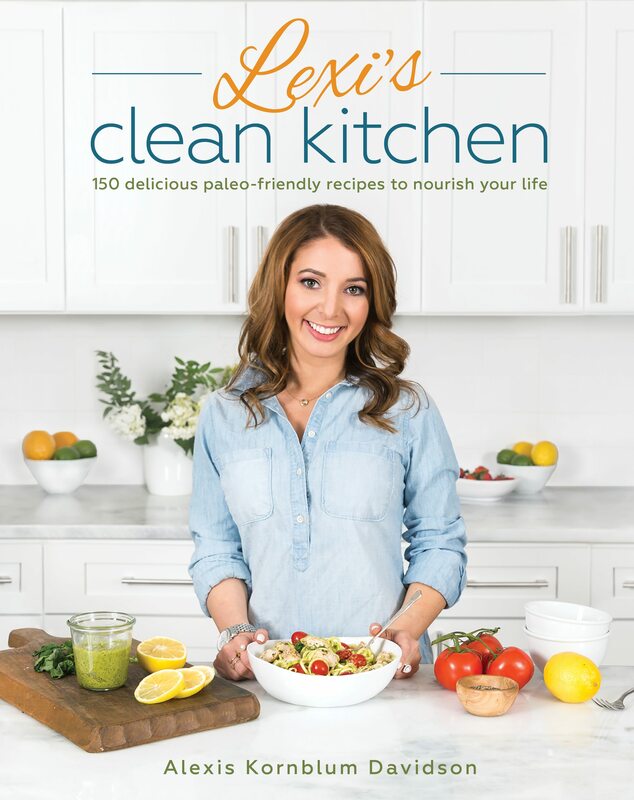 Thank you for always making foods that we all used to enjoy during a pre clean eating life nice and squeaky clean!! Cant wait to make these!! Thank you!! Wow!! This looks like an amazing recipe! I. Am excited. I appreciate your clear instructions and beautiful pictures. My kids will eat anything with chocolate chips! I never knew you could freeze these! I’ll have to prep these for breakfast on the go! Looks delicious! Can’t wait to try this recipe. Thanks!! Like all your recipes this looks amazingly delicious and easy enough to prepare for those busy mirnibgs! Thank you and Enjoy Life for this awesome giveaway! Can’t wait to try this!! My husband has been looking for something new for breakfast! Yum!! Can’t wait to make this, this weekend! I LOVE enjoy life and this oatmeal looks epic! This looks amazing! Oatmeal is my go-to for breakfast and having it baked ahead would make mornings so much easier. 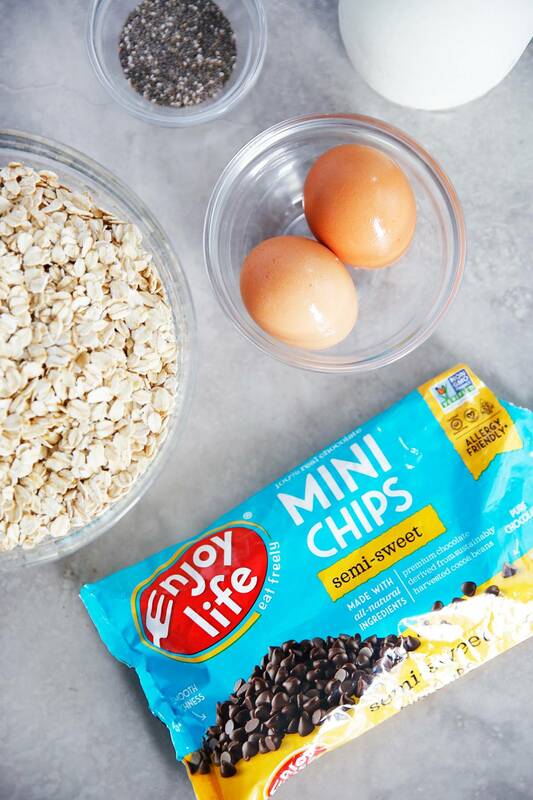 I’m also excited for this giveaway because Enjoylife are the only chocolate chips I use! Seriously nothing better than PB and chocolate! I could eat this every morning! I eat Enjoy Life chocolate chips right out of the bag. They are so delicious! YUmmy! I want to try this out for my husband’s breakfast meal prep. Enjoy life are my fav! This looks so yummy!! I’m sure it’ll be toddler approved too! Peanut butter & chocolate combo are always a fav. Perfection! Year round, crowd pleasing deliciousness! This looks amazing! I actually just got your cookbook in the mail last week. I am soooo excited to start using it. Yes to all of these flavors!! I can’t wait to try this! Also, I don’t think my husband’s ears would forgive me with the amount of excited screaming that would go on if I won a year’s supply of Enjoy Life! They are my go to chocolate and definitely my favorite treat! I love the new semi-sweet chips! Thanks for the chance. 😍 Tagged friends on IG as @fizzygig. OH MY GOSH!!! Looks so good!! This looks so good!! Enjoy life products are my favorite. Looks like a great kid friendly recipe! Looove this for easy breakfast for my kids!! This would definitely get me out of bed in the morning!! Making this tomorrow morning again and I can’t wait!!! I’ve made sooo many of your recipes and I’ve NEVER been disappointed! This looks amazing! Love your recipes. Going to try this for kids as our busy sports weekends now start! This is exactly how I’d love to start my day!! So delicious and Enjoy Life is an absolute favorite! EnjoyLife are my saving grace when craving chocolate. Can I use an egg substitute in this recipe? Oh my goodness – chovolate, OB and bananas, what a perfect combination! Looking forward to giving this a go! Thank you! Your recipes are so awesome and this one is no exception! I love your blog and your cookbook! Making these first thing tomorrow morning! They look simple enough for my toddler to help, which is always a plus! 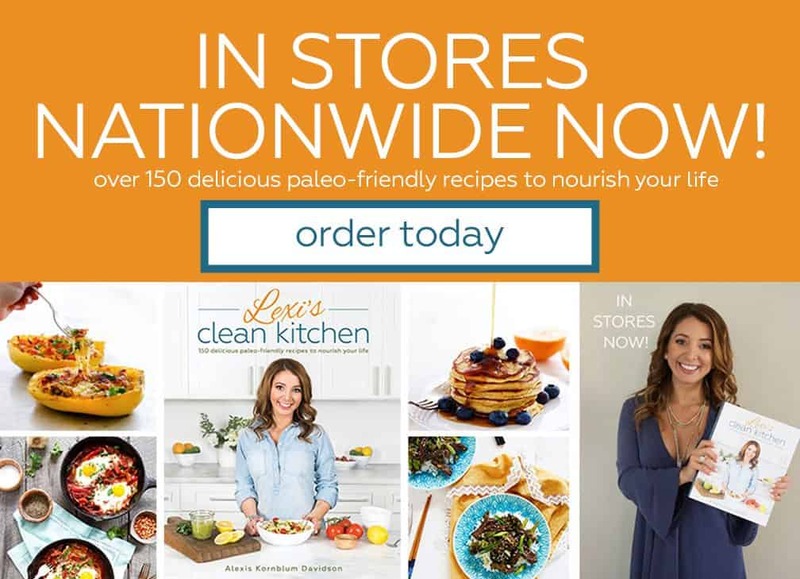 I so appreciate that many of your recipes use ingredients I usually have on hand– no special trip to the store needed! I don’t think that would work but I haven’t tried it! This is the perfect meal-prep breakfast!! It’s easy to make, I already had 98% of the ingredients at home, and it’s easy clean up. Oh, and of course it tastes delicious! Going to experiment next with using different types of nut butters and fruit instead of chocolate chips (blueberries, raisins, etc). I’m looking for easy, freezer-friendly breakfasts to give my toddler on busy mornings and I think this will be perfect! I might sub in the choco chips for some fruit and I know it’ll be a hit! Looks yummy. Chocolate chips are always a good option! Ooh, I happen to have all of these ingredients (including Enjoy Life mini chips, which I may or may not eat straight from the bag). I’m so making these soon! This just took my breakfast game to the next level! Thanks, Lexi!! This is my kind of breakfast! The perfect way to start my day! So thankful for Enjoy Life! I’m trying this recipe on Friday! Looks incredible! I love baked oatmeal- throw in peanut butter and chocolate and I am even more in love!! Yummy! Mmmmmm, maybe I should try making and freezing them in muffin cups! 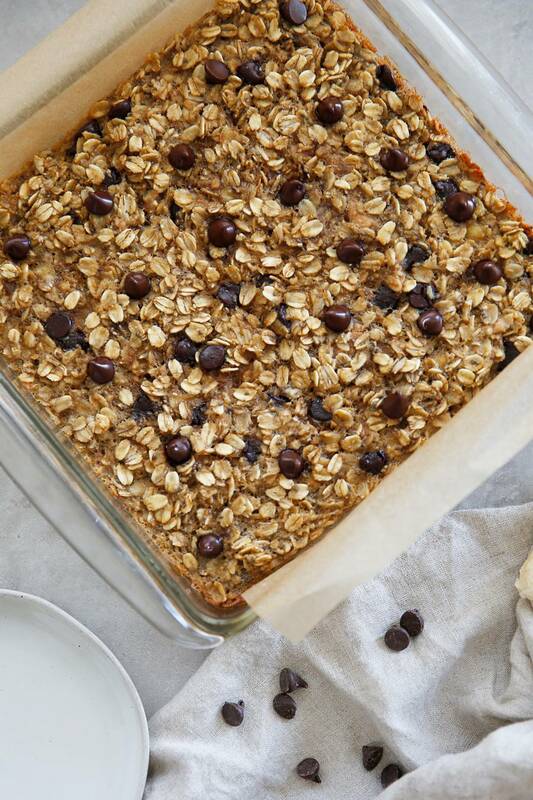 My family loves baked oatmeal, so we will definitely give this one a try! We love Enjoy Life products. They are so much more than chocolate chips. Your cupboard could be filled with enough snacks to suit any taste. Great recipe, so easy to prepare! Made these the other day for my hubs to have a grab and go breakfast. They were super easy to make and we loved them! I was even able to find Enjoy Lifes mini chips in my grocery store which was very exciting. Just put this in the oven to have for breakfast this week. It was so easy and I loved that I had everything ready to go in my kitchen since I haven’t been grocery shopping yet. Another hit! Just pulled these out of the oven and they smell AMAZING!! Thanks for creating another fantastic easy recipe. Just like the commented above, I had everything in my pantry. It’s the best! 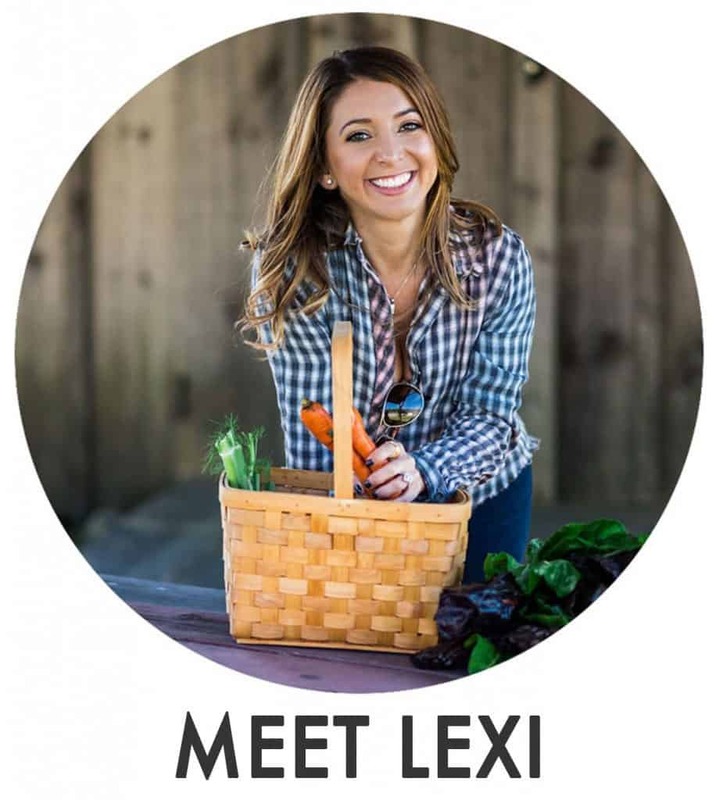 I know you teach us Lexi to live Gluten Free and Dairy Free, but I also thought your eating plans were Paleo. I did not know we could have oatmeal on paleo. just asking. So good cant wait to try the other flavors! This was such a hit with my family. My kids love it and my husband as welll, plus it freezes really well. My kids were tired of eating eggs for breakfast every morning and they don’t normally eat oatmeal but they will eat this up! This is amazing! What’s the best way to reheat in the morning? I just baked it this evening and want to serve it in the morning. Can I pop it into the oven for a few minutes to reheat or will it dry out? Thanks! Eggs are what binds it. You could give flax or chia eggs a try. Let us know if you do.